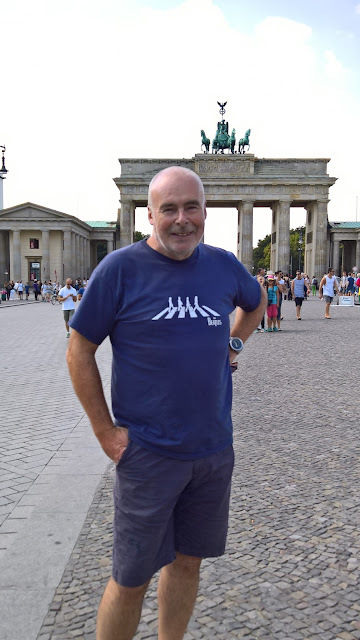 A few days in Berlin began today with an early morning Aer Lingus flight to Tegel Airport where just one guy checked all the passports of EU travellers. However. This was just one blip in an otherwise great introduction to Berlin. We are staying in the Indigo hotel near Alexanderplatz - very pleasant. My first port of call, and as a consequence for Roma too, was to go and see the Brandenburg Gate. It was about a 30 minute walk from our hotel. This monument survived the Second World War and looked over the Berlin Wall for over 25 years. We had lunch in a place with expensive Mercedes cars on Unter den Linden. 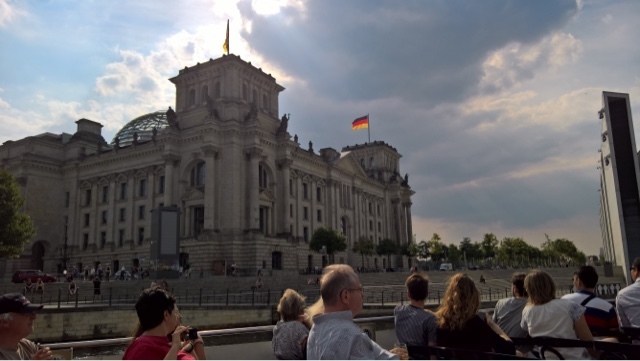 Then we decided to go on a boat cruise on the Spree - this is really a great way to see the heart of Berlin. After getting off the boat we were in front of the DDR museum - we went in to see the short history of the former East Germany. The museum pulls no punches in labelling the former DDR as a failed state that oppressed its citizens. 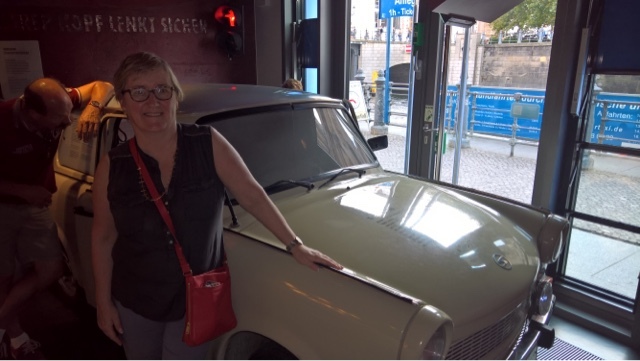 I saw a Trabant car for the first time (a piece of junk) and learned how the East Germans lived under the oppression of the Communist Party (SED). Following this we stopped for a beer in Alexanderplatz and later dined at Frascatellis where I had Currywurst - I can tick that one off the list of things to do with the rest of my life. 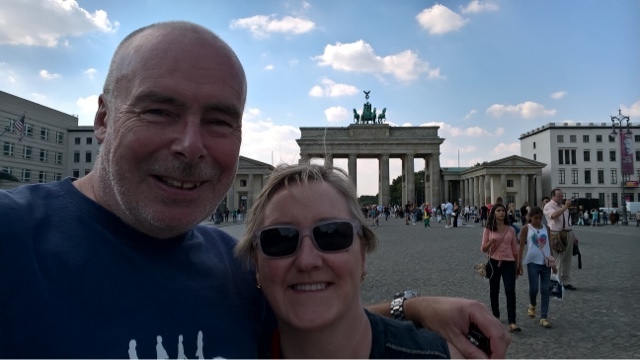 Roma and me at the Brandenburg Gate. The Reichstag from the Spree. 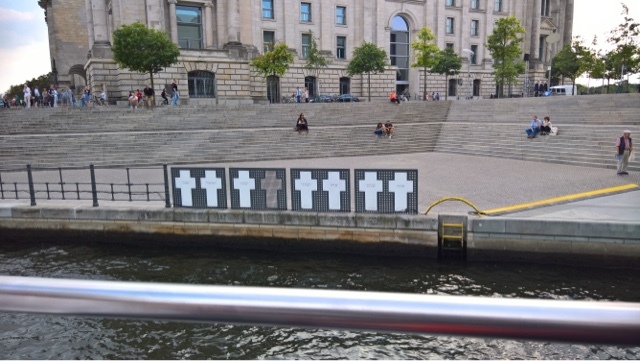 Crosses marking the place at The Wall where escapers were killed. Roma with her new car - a Trabi! 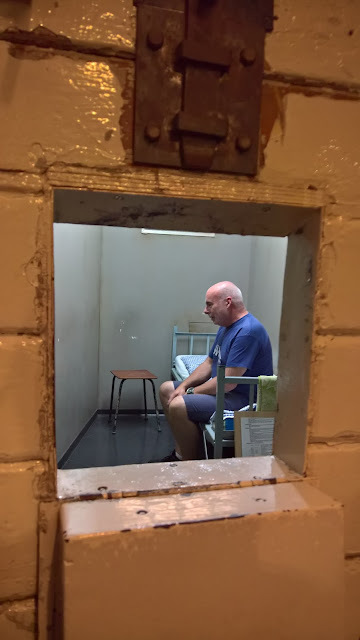 Finally - my crimes have caught up with me!